U.S. & 27 Other Countries Launch Military Exercise In Strait of Hormuz. Iran To Be Nuclear In Less Than 6 Months. Israeli Prime Minister Benjamin Netanyahu argues his case for establishing 'red lines' on Iran's nuclear program on NBC and CNN today. Israeli Prime Minister Benjamin Netanyahu speaks during a joint press conference with his Bulgarian counterpart Boyko Borissov, not seen, in Jerusalem, Tuesday, Sept. 11. On Sunday interviews with Netanyahu will air on NBC and CNN. He will argue the US should establish clear restrictions on Iran's nuclear program. Israeli Prime Minister Benjamin Netanyahu is taking his case for stronger action against Iran straight to the American people, after facing stiff opposition from the Obama administration. Mr. Netanyahu’s interviews with NBC and CNN, airing this morning, coincide with a report that Israeli officials have been trying in vain for months to convince their US counterparts of an increasing radicalization across the Middle East. Those trends, Israel reportedly warned, concern not only Israel but also US interests in the region, according to an article in Israel’s left-leaning Haaretz newspaper. Over the weekend, Iran and its allies made a series of threatening statements toward both the US and Israel. On Friday, Iranian President Mahmoud Ahmadinejad reiterated his conviction that the "Zionists" would disappear, while a military adviser to Iran’s supreme leader threatened retaliation in the event of an Israeli strike, according to Reuters. KUWAIT CITY, Kuwait | The United States, along with more than 27 other countries from four different continents, began Sunday the largest ever military exercise aimed at practicing how to find and destroy sea mines in the waters of the Middle East. “This is about exercising capabilities that we want to exercise with our partners in the region,” said Pentagon spokesman George Littler this week.” Earlier this summer Little stressed that this training was not aimed at delivering a message to Iran. However, with tensions heating up with Iran, and Israel threatening to bomb Iran’s nuclear facilities, a number of observers say the maneuvers at sea are aimed at Iran, and could be a dress rehearsal for war with the Islamic Republic. U.S. Defense Department officials reject that characterization. Last week, Iran’s Foreign Ministry said the country will closely monitor the exercise. Spokesman Ramin Mehmanparast told reporters that the military maneuvers are a “very sensitive phenomenon” amid rising tensions over Tehran’s nuclear program. The Pentagon has beefed up its deployments aimed at countering Iran over the past year. This summer, the Navy doubled from four to eight the number of dedicated mine-hunting ships in the Persian Gulf. It also deployed a newly converted ship, the USS Ponce, to serve as a staging and command post for mine hunting operations. It also has kept two aircraft carrier strike groups in the Persian Gulf, cutting short the home stay of one aircraft carrier in the United States in order to maintain the presence of two such vessels in the Mideast region. Over the past year, Washington and its global partners have heightened economic sanctions on Iran in order to pressure the country to curb its nuclear development program. In response, Iran has threatened to mine the Strait of Hormuz. Iran is believed to have 2,000 to 6,000 mines of varying sophistication. Sea mines are floating devices that explode when they come into contact with ships. 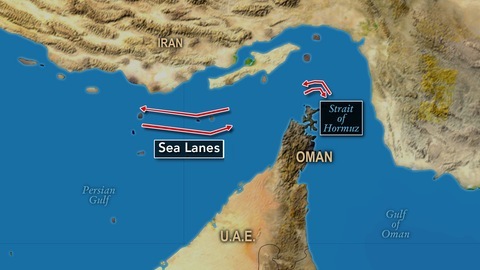 The Strait of Hormuz is one of the world’s most important choke points, according to the U.S. Energy Information Administration. Roughly 20 percent of the world’s oil passes through the narrow sea passageway. Last year, roughly 14 crude oil tankers passed through the Strait of Hormuz every day, carrying 17 million barrels of oil. At its narrowest point, the strait is 21 nautical miles wide. However, the two shipping channels — one for northbound traffic and the other for southbound — each measure just two miles wide and are separated by a two-mile buffer zone. 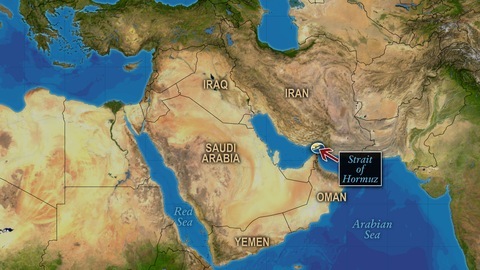 Still, Iran is unlikely to mine the Strait of Hormuz at the current time, according to a wide array of analysts interviewed for this article. “They would be hurting themselves the most because they would be cutting off their main source of revenue, which is oil exports, at a time when they are already being sanctioned heavily and money is tight,” said Karim Sadjadpour, a senior associate at the Carnegie Endowment for International Peace. In addition, China — Iran’s main customer for oil — would not like to see the flow of oil from the Persian Gulf curtailed, Sadjadpour said. “China is Iran’s key commercial and strategic patron and they would really alienate the Chinese” if Iranians were to mine the strait, he said. And Tehran relies on the Strait of Hormuz for another reason: imports. However, there is one condition under which Iran might be more likely to mine the Strait of Hormuz, according to Iran watchers: if Israel were to bomb Iran’s nuclear facilities. Another scenario under which Iran might mine the Strait of Hormuz is if its ability to export oil is completely cut off, according to Nader. If Iran “can’t sell most or any of its oil,” it might “retaliate by blocking the Strait of Hormuz or impede shipping,” he said. The PBS NewsHour’s deputy foreign affairs and defense editor Daniel Sagalyn is in the Persian Gulf and will be covering the International Mine Countermeasures Exercise, which runs Sept. 16-27. 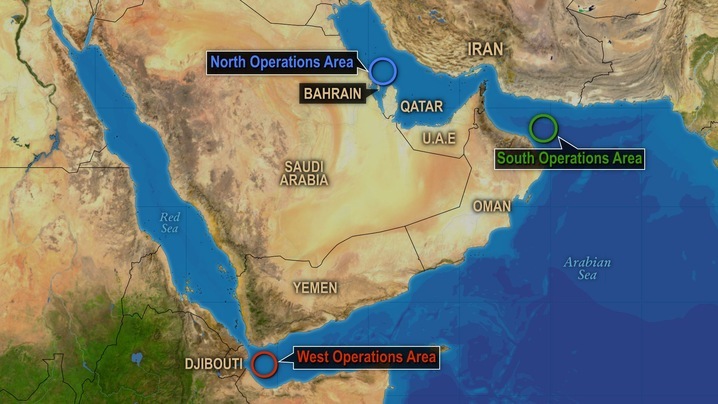 The U.S. and 29 other nations have begun the biggest mine-clearing exercise in the Persian Gulf region, a show of force as tensions escalate over a threatened Israeli attack on Iran’s nuclear facilities. The 12-day exercise that started yesterday involves Western nations such as the U.K. and France, as well as participants as varied as Japan, Yemen, Jordan, New Zealand and Estonia, according to the U.S. Navy. In an effort to avoid a showdown with the Islamic Republic, it won’t extend into the Strait of Hormuz, the waterway between Iran and Oman through which as much as a fifth of the world’s traded oil is shipped daily. In addition to serving as a warning to Iran, the display of power will “signal to Israel that the United States has a military option available” and show “U.S. resolve to its Persian Gulf allies, especially in the face of repeated Iranian threats to try to close the Strait of Hormuz,” according to Kenneth Katzman, a Middle East specialist for the nonpartisan Congressional Research Service in Washington. Participating nations will conduct mine-hunting and mine- countermeasure operations with MH-53E Sea Dragon helicopters, as well as explosive ordnance disposal, diving, and small-boat exercises and port-clearance operations focused on underwater improvised explosive devices, according to the U.S. Navy 5th Fleet, which is headquartered in Bahrain. The exercise will focus “on a hypothetical threat to mine the international strategic waterways of the Middle East, including the Red Sea, the Gulf of Aden, the Gulf of Oman, and the Persian Gulf,” the U.S. Central Command in Tampa, Florida, said in a statement. Iranian officials have periodically threatened to close the Strait, which is 21 miles (34 kilometers) wide at its narrowest point, in retaliation for tightening international sanctions aimed at dissuading them from developing a nuclear weapon. Laying mines or sinking a ship in the Strait would disrupt tanker traffic and also prompt insurance companies to raise rates on tankers, leading at least temporarily to higher oil prices. Brent oil for October settlement closed at $116.66 a barrel on Sept. 14 in trading on the London-based ICE Futures Europe exchange. The contract, a benchmark for more than half of the world’s crude, has gained 8.6 percent this year. Iran’s Revolutionary Guard Corps is ready to fight a possible military offensive and “nothing will remain” of the Israeli government if it attacks, Major General Mohammad Ali Jafari, commander-in-chief of the corps, said yesterday, according to the official Islamic Republic News Agency. Israeli Prime Minister Benjamin Netanyahu and Defense Minister Ehud Barak have said Israel may have no choice but to launch a strike against Iran’s nuclear facilities as international negotiations stall over the program. Netanyahu has become more vocal in demanding that the U.S. define clear limits since Secretary of State Hillary Clinton said in a Bloomberg Radio interview on Sept. 9 that the U.S. is “not setting deadlines” on negotiations with Iran. In addition to the mine-sweeping exercise, the U.S. has two aircraft carrier strike groups in the region currently, with the USS Enterprise in the Arabian Sea and the USS Dwight D. Eisenhower in the Persian Gulf. The carriers’ presence tells Iran the U.S. “can easily project devastating power onto Iranian soil at a moment’s notice,” Katzman of the Congressional Research Service said in an e-mail. Defense Secretary Leon Panetta told CBS’s “This Morning” on Sept. 11 that “we have the forces in place to be able to not only defend ourselves, but to do what we have to do to try to stop them from developing a nuclear weapon.” Iran says its nuclear program is for civilian purposes. The mine-clearing exercise’s multinational participation shows “we are not alone -- it’s just not the United States ‘bullying’ Iran,” Michael Eisenstadt, director of military studies at the Washington Institute for Near East Policy, said in a phone interview. China Versus Japan. More Violence. More War. What Happens If Israel Attacks Iran? Run. Fight. Hide. When Things Go Bad. My Muscles Are Sore from All the Cringing While Reading the Mortal Instruments Series...HELP! Natasha Call - Issues On Call. Travel theme. Theme images by follow777. Powered by Blogger.